Today in Masonic History - The Masonic Fool? Today in Masonic History we present The Masonic Fool? 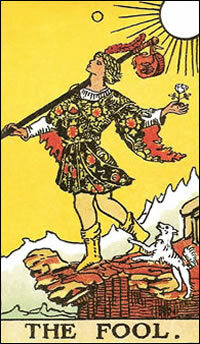 The Fool is a card from the 22 Major Arcana found in a Tarot Deck. The history of the Tarot Cards dates back to the 15th century where they were found all around Europe and used for the playing of various games. It was not until the 18th century that the Tarot started to be used for divination. It was in the late 19th century that the deck most connected with Freemasonry and containing the most masonic symbols arrived on the scene. Arthur Edward Waite, a Freemasons was one of the creators of the Rider-Waite deck. It is also the tarot deck that most people are familiar with. In the deck, as an example of masonic imagery, the High Priestess card which is second in the Major Arcana, is displayed with pillars on either side of her. The left one indicating the letter B and the right indicating the letter J. The masonic reference is very clear to masons. With respect to the date, we will be discussing the Fool card, labeled as zero in the Rider-Waite deck and given no number in most other decks. At first glance the Fool card has no real noticeable masonic connection. When you start to dig deeper though, the masonic connections become somewhat clearer. In the Fool's hand he carries a white rose, a symbol of purity, much like a Master Mason's apron. It is also said that it is a symbol of freedom from baser desires. Perhaps a way of subduing his passions? Over his shoulder, the Fool carries his possessions. As it is depicted the bag is supposed to represent untapped collective knowledge. In other words, the Fool already carries the answers with him, he need only have the wisdom to look within. Most notably in the image, the Fool is about stroll over a cliff. Recently in a masonic discussion this card was debated by several of us present. There were some interesting thoughts that came out, about why the Fool was about to step of the cliff, as seen through a mason's eye. One of the thoughts that came from this discussion was the idea that the Fool was not actually stepping off into oblivion, he was actually taking a leap of faith. Although there was little motivation discussed as to why he was taking that leap, much of the group compared it with their entry into the Freemasonry. We come to the door of the lodge often with some level of a per-conceived notion, it is not until we enter the lodge, trusting in those around us (a leap of faith) that we are able to tap into the collective knowledge of the lodge and the fraternity. This is not to say a metaphysical connection, but a real tangible connection with the ideas of Freemasonry and the different view points of others into some of the hidden meanings contained within. In this sense it is a Masonic Fool, regardless of time or experience in the fraternity, who does not listen to the collective knowledge of those around him, who may see the symbols with a different take because of the varied experiences of his Masonic brothers.